This ministry comprises choirs and musicians who are responsible for the music, commentating, psalming and cantoring during the liturgy. Choir members participate in the practices, celebration of Eucharist and fellowship activities of each individual choir and community. The goal and purpose of the Liturgical Music Ministry is to heighten the Word of God and provide beauty to the liturgy through music. We serve as a ministry to the congregation seeking to provide appropriate music for prayer, reflection and meditation. 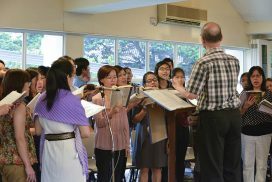 The Saint Maximilian Kolbe Choir was formed from an off-shoot of Filipino ladies singing for the 7am Mass led by Felicitas Yeo, Michelle Loh, and Sister Agatha Tan. In 1991, the formation of the choir began when members were enrolled from the 7am congregation, with the efforts and encouragement by the late Father Abrial. Through the years, the choir has grown from a small group to its current membership size of more than 30, consisting of family members and many others from various walks of life. Recognising the importance of the Word of God in our ministry, the choir gathers to reflect on the coming weekend’s readings before practicing the music proper for the coming Sunday Mass. In addition to our regular Sunday Mass duties, the choir assists at weddings and other liturgical feasts in the Parish. We also enjoy community gatherings, such as the annual community meal in honour of our choir’s patron saint, Saint Maximilian Kolbe, whose feast we celebrate on August 14. “Come and see” – these words of Jesus in John 1:39 are our invitation to you, to come and see what being in this community is all about. The Genesis Family Choir began in 1980, firstly as an Altar Boys Choir as suggested by then Parish Priest, Fr Louis Amiotte. It then took in members from the first ever post-confirmation group, Genesis, in 1985 and was then renamed as the Genesis Choir. In addition to our regular Sunday evening mass duties, the choir also performed at other church events. The choir has also organised fund-raising events and participated in Fun Fairs as well. The choir has grown to be nearly 30 members strong and has seen an influx of youth and family members, hence the evolvement of its name to the Genesis Family Choir. The choir continues to sing at the Sunday evening mass and commits itself to be part of major feastday celebrations and weddings too. The members also enjoy community meals, lead prayer sessions and rosary devotions through the year along with the occasional spiritual retreat. A good mixture of youthful exuberance and seasoned members, the choir takes delight in leading the music liturgy every Sunday and encourages more parishioners to join us. The Parish of Saint Francis Xavier has four choirs that serve at its weekend Masses. If you are interested in contributing to this ministry, please contact any of the choir coordinators for more information.